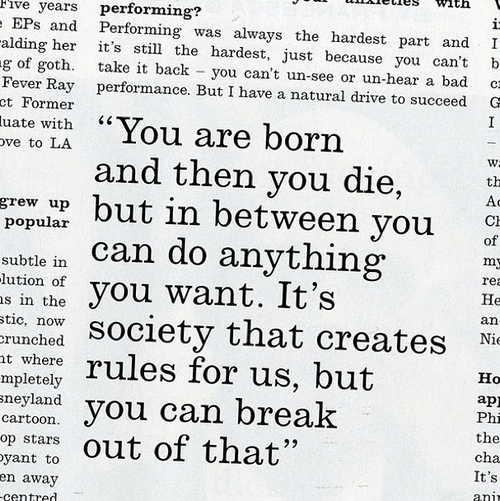 ….But You Can Break Out Of That. We may never know who wrote these genius words but we can try to remember to live by them each day. You truly can do ANYTHING. As long as you have the will, you’ll find a way. No one’s opinion of you matters more than your own and the sooner you LIVE that the better your life will be. Your life is what you make it; not your current circumstance. Now get out there and start living your life for you. You’ll be glad you did and your life will be healthier and happier because of it. With that kind of ingenuity, even society can appreciate the revelation of living your truth. Not that it matters, really…..because you did it all for you.